The hill station Sitalakhet is not popular, but it is small and beautiful. It is only well known by the locals for its beautiful fruit orchards and lush green forests. The incredible surroundings of the place with the majestic snow capped peaks are just mind blowing. It is the home of the village of Khoont where the great freedom fighter Govind Vallabh Pant was born. The most important attraction of Sitalakhet is the Syahi Devi Temple. It is on a small hill in Almora. It is said to be a very holy temple and the deity there, Syahi devi is said to be the savior of Almora. Colourful fairs are held here especially during the Navaratri Festival. 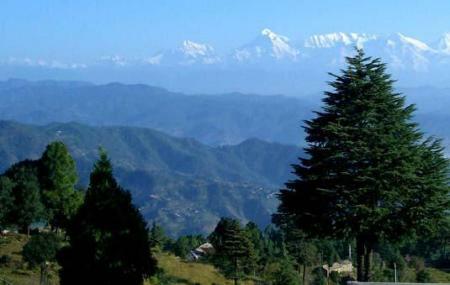 Sitalakhet is a part of the Kumaon Tourism. The main languages spoken here are Kumaoni, Gadhwali, Hindi and English. Thus, this place is a must visit at least once. The place can be visited at anytime during the year except extreme winters when the temperature is unbearably cold here. It is an ideal picnic spot also. Photography is allowed for free over here. The nearest airport is the Pantnagar Airport, Kasauni. The nearest railway station is the Kathgodam Rail Station Junction. Drive to here from Ranikhet. Love this? Explore the entire list of places to visit in Almora before you plan your trip. Fancy a good night's sleep after a tiring day? Check out where to stay in Almora and book an accommodation of your choice. People normally club together Binsar Mahadev Mandir and Snow View Resort while planning their visit to Sitalakhet. People also prefer to end their day with Sitalakhet.